VANCOUVER, February 21, 2018 – Walmart Canada and Sustainable Produce Urban Delivery (SPUD) announced today an agreement to offer SPUD’s food delivery platform, Food-X Urban Delivery Inc. (Food-X), to Walmart.ca customers in Metro Vancouver. Food-X helps Walmart fulfill last mile home delivery and — through shared warehousing and consolidation of orders — reduces waste, truck trips and greenhouse gas (GHG) emissions. This agreement also expands on Walmart Canada’s commitment to make grocery shopping easier for customers in urban centres like Vancouver – where there may not be convenient access to a Walmart Supercentre – and for customers who prefer to shop online. When the service is up and running in summer 2018, Walmart customers will shop online at www.walmart.ca for Walmart products at Walmart’s low prices every day – all backed by a 100% satisfaction money-back guarantee. Product assortment will include fresh groceries, including fruits and vegetables, 100% Canadian AAA Angus beef, pork and chicken and seafood, dairy, baked goods, deli and frozen foods. Customers will also have a selection of organic items to choose from. 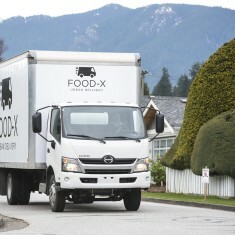 A Food-X truck will deliver groceries directly to customer’s home, as early as next-day. Food-X Urban Delivery Inc. is a wholly-owned subsidiary of Sustainable Produce Urban Delivery Inc. (SPUD). Founded in 1997 in Vancouver, SPUD has expanded into one of the largest online grocery companies in Canada, employing over 600 people across all its markets delivering fresh, local, organic produce and groceries. With a mission of changing the world one bite at a time and passion for a sustainable food system, SPUD’s goal is to use its connection to local and organic food to help improve the places where we live and work. From this vision, Be Fresh Local Market was proudly cultivated by SPUD, with the first store opening in Vancouver’s Kitsilano neighbourhood in 2015. Be Fresh currently serves five local communities in Vancouver. In 2017, Blush Lane Organic Market joined the SPUD family supporting Edmonton and Calgary across five locations. SPUD is a leader in Western Canada's local and organic food movement. For more information, visit www.foodx.ca.